Overview: In 1963, Stan Lee and Don Heck teamed up to create a modern day knight in the midst of the Cold War. Tony Stark was a weapons manufacturer that had everything he could ever need, with the looks, the women, and the money to do anything. Visiting troops in Viet-Nam to see his weapons in use, Stark is injured in a land-mine explosion, which placed metal shrapnel next to his heart. Captured by the evil warlord Wong-Chu, Stark and Professor Yinsen build a suit out of iron to use in an escape. Stark dons the armor, and Iron Man is born. Following his return to the United States, we see Tony Stark try to balance his life between his business responsibilities for Stark Industries, and the need to put on the Iron Man armor to fight the super-villains popping up left and right. We meet his closest friends – Happy Hogan serves as Stark’s chauffeur and confidant, and Pepper Potts is his loyal secretary who keeps her love for her boss hidden away. Iron Man is introduced as Tony Stark’s bodyguard, which explains why Iron Man shows up so often when Stark is in danger. The villains are a mix of Cold War enemies (Crimson Dynamo, Titanium Man, and the Black Widow) and major threats at home (Melter, Blizzard, Unicorn, and Hawkeye). The Black Widow and Hawkeye would later reform their ways, and eventually become loyal members of the Avengers, the super-hero team which Iron Man helped to found and financed for many years. The Avengers make numerous appearances in these stories. What makes this Essential? : I find myself being more impressed with this volume over time. While the first year of stories are somewhat clunky (no pun intended), it smooths out and finds it’s footing in the following two years. The number of characters created with lasting impact is very remarkable for stories that were 8-to-12 pages per month. You can read these stories and get a solid understanding of all things Iron Man, even more than the later Essential volumes. If you are a fan of Iron Man or the Avengers, pick up this volume. Shades of Gray: Following in the footsteps of the Incredible Hulk, the first appearance of the Iron Man armor in Tales of Suspense #39 was all gray. In the next issue, the armor was painted in the traditional red and gold. Footnotes: As time has moved further and further away from the Viet-Nam war era, the origin of Iron Man has been updated to match the current era. The basic storyline remains the same, with Stark being injured and forced to create the armored suit. However, the location has been updated to the first Gulf War in the 1990s, and then to the wilds of Afghanistan in the last decade. If you like this volume, try: another viewing of the first two Iron Man movies. The origin of Iron Man is visually exciting in the first movie, and the supporting cast with Pepper Potts and Happy Hogan make the Tony Stark aspect of the story just as important as the Iron Man aspect. In the second movie, the Black Widow is introduced, and Anton Vanko was used as a combination of Whiplash and Crimson Dynamo. This entry was posted in Iron Man, Marvel Essentials and tagged Don Heck, Iron Man, Stan Lee. Bookmark the permalink. Love what you’re doing on this site, but just wanted to point out that Iron Man actually went from the all grey armor to all gold for a few issues before the red and gold. You are absolutely correct! Here-in lies the danger of reading a lot of reprinted comics in black and white. Thank you for the heads-up! 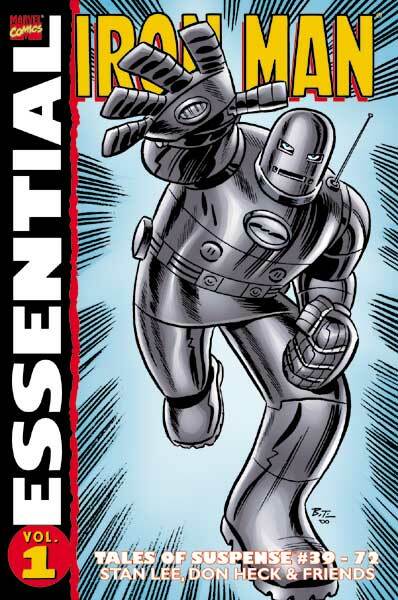 Pingback: Throwback Thursday – Essential Iron Man Vol. 1 | WORST. COMIC. PODCAST. EVER!